New reporting software not only chops and slices data, but recommends actions. 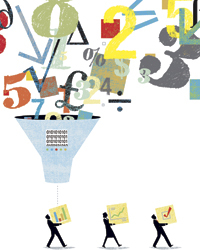 The key to smarter, more decisive treasury management may lie in getting not just reports that supply data, but intelligent reports in which data have been aggregated, sorted and analyzed, reports that may even point out the best steps to take to control risk, optimize returns or improve efficiency. While there’s still a gap between the potential and the reality of such reporting, the gap is closing.